Absolutely unbeatable low wind kites, this huge sled power kite will provide real fishing pull in winds as low as 2 to 4 knots! The Mega Mouth Kite is the kite fishers ultimate secret weapon that will keep you fishing in low wind conditions impossible to fish with any other kite. A huge 20 square feet of sail area, this high power kite is not recommended on line weights under 65 kg or in winds above 18 knots. 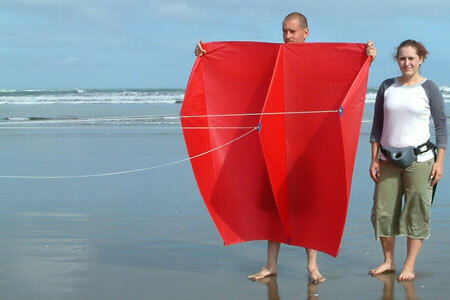 So powerful, the Mega Mouth Kites have been used to haul out nets from shore, for beach seining and for towing canoes. * The Mega Mouth Kite will fly well in winds stronger than 18 knots, however it is extremely difficult to haul down in strong winds without leather gloves. Unless you always fish in winds below 20 knots we don't recommended the Mega Mouth as an only kite. You may not be able to pull it down in stronger winds! 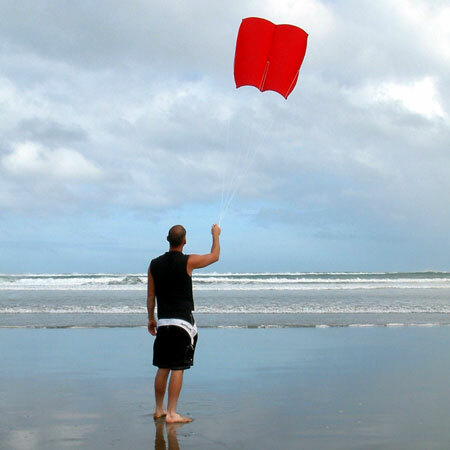 These are big kites and are best purchased as a light wind option by fishermen who have a large kite fishing rig with a Nighthawk or Super kite for using in stronger winds. This kite gives a good overlap as the mega mouth will often fly when the winds are too light for the Delta kites to fly in. This kite is very easy to launch even in low winds. These are monster kites! The recovery line is the slack line hanging below the three string bridle. The huge Mega Mouth Kite (pictured) tows out a 2.5 km 100 kg Bottom Longline Rig in 4 to 6 knots of wind. Four litres of sand is required in the float to keep the hook section in the water in 15 knots of wind. The huge pull of the Mega Mouth is the reason why most kite fishers that use them have a Paul's Fishing Kites power winch. Excellent for low wind areas, these power kites are the ultimate for holding gear against strong rips or anytime you need additional pull. These giant kites are ideal kites for lifting cameras aloft for aerial photography. Mega size, mega easy flier kite!